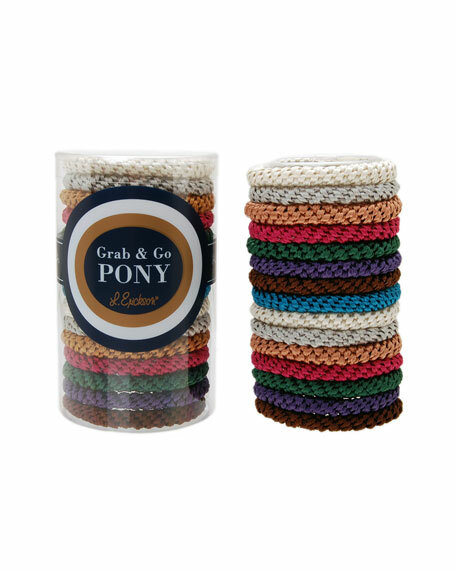 Set of 15 L. Erickson non-damaging hair elastics. Presented in clear tube for easy storage. Colette Malouf "Gemology Luna" ponytail holder. Featuring gradient Lucite® acrylic piece. Mokuba round elastic band. Brass logo bead. Colette Malouf ponytail holder with hanging acrylic heart detail. 10-karat gold barrel bead. Round elastic band. Colette Malouf "Star Fossil" ponytail holder. Featuring Lucite® acrylic piece with star detail. Mokuba round elastic band. Brass logo bead. Epona Valley ponytail holder with two roses of lambskin leather. Completely handmade, leaves and petals cut and shaped by hand. Epona Valley ponytail holder with two roses of lambskin leather. Completely handmade, leaves and petals cut and shaped by hand. Approx. 4"W x 2.5"D. Made in USA of imported material.